"It shall be unlawful for any person—in or affecting interstate or foreign commerce, to manufacture, possess, or transfer any part or combination of parts that is designed and functions to increase the rate of fire of a semiautomatic rifle but does not convert the semiautomatic rifle into a machinegun," the bill reads, "or to manufacture, possess, or transfer any such part or combination of parts that have been shipped or transported in interstate or foreign commerce.’"
The language of the bill may ban the manufacture, sale, or possession of aftermarket triggers, bolts, or other components that have any effect on increasing a rifle's rate of fire. The ban would go into effect 90 days after the enactment of the bill into law. Curbelo's colleague, Rep. Seth Moulton (D., Mass. ), said Congress could do more on the issue, but the bill represents a "crucial starting point." "I am proud to be leading on the only bipartisan effort to take action in the wake of this tragedy," Rep. Moulton said in a statement. "We can always be doing more, but this bill is a crucial starting point. Congress needs to take a serious look, after every crisis, at whether a law consistent with the Second Amendment would have prevented it. It is time for Democrats and Republicans alike to find the courage to act." Sen. Dianne Feinstein (D., Calif.), who has introduced bills with similar wording in previous years, said calls from the NRA and others for the Bureau of Alcohol, Tobacco, Firearms, and Explosives (ATF) to reexamine the legality of bump fire stocks were not enough. "The ATF lacks authority under the law to ban bump fire stocks," Feinstein said. "Period. The agency made this crystal clear in a 2013 letter to Congress, writing that ‘stocks of this type are not subject to the provisions of federal firearms statutes.' Legislation is the only answer and Congress shouldn't attempt to pass the buck." 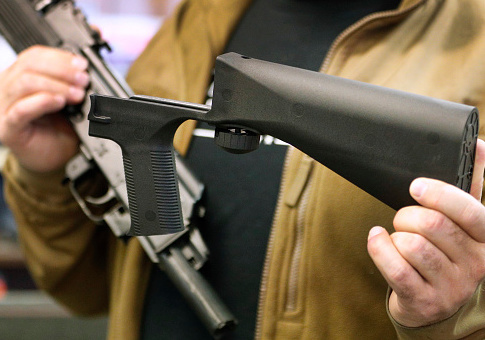 The ATF has explained its classification process for firearms and firearms accessories but has not yet said whether they will review their decision on bump fire stocks. This entry was posted in Issues and tagged ATF, Gun Control, Guns, New Gun Laws, NRA. Bookmark the permalink.